My love eagerly awaiting the morning. Spousal Unit doling out the presents. Douglas joining us opening his stocking. 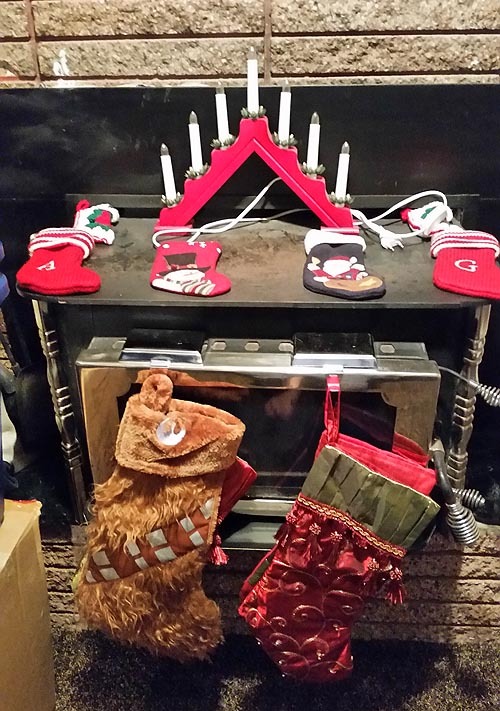 My sister also had a stocking, but I don't have a picture of the contents--she didn't join us until much later in the day due to work. The following shots are what it looks like outside right now. Beautiful, pure white snow had fallen in the night. It was so perfect. 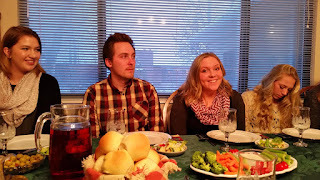 For the first time, I was able to attend Spousal Unit's family Christmas Eve dinner, which was held due to most of the local members being in town this year. Spousal Unit had a really bad strep infection he got during our Maryland trip that he's still battling, but he's much, much better after antibiotics and rest. It seems the tradition is an early supper followed by an evening devotional. Spousal Unit's parents put together a program with Biblical passages and hymns and other Christmas music for the family to sing together. It was an amazing evening. 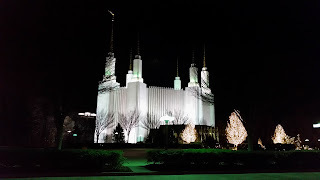 The night before Spousal Unit and I went home, I went with his brother's family to the Washington DC Temple to see the lights. Spousal Unit was unable to come because yesterday he became very sick and spent the whole day today resting. Hopefully he'll get better before we travel. It was so beautiful. I also found out that the different embassies in DC will send Christmas trees and nativities to the temple's visitor center, which was open when we came! I didn't expect it to be open when we got there, but it was! Enjoy the photo spam.